Not your typical pancake because it is “eggy”. You really need to mix it up in a blender. Place butter in baking dish and melt it in the oven. Slice your apple and set aside. In blender, mix eggs, flour, milk, vanilla, and salt. When butter is melted, place apples in the butter, stir to cover them and sprinkle with cinnamon. Pour mixture over the apples. Bake 20-25 minutes. 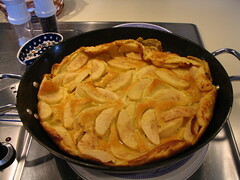 Serve with syrup, yogurt, powdered sugar, any fresh fruit. Goes very well with some breakfast links and black coffee. The modifications/additions to this are almost endless. Doubles fairly well as is. May want to decrease the eggs from 6 to 5, but don’t skimp on the butter or it will stick too much and it won’t fluff up along the edges of the pan. I have to bake this a little longer if I’m doubling b/c I use the same pan either way. This is doubled. I skimped on the butter…tsktsktsk and it didn’t fluff up quite as well.